Photo courtesy Visit California in partnership with AFAR. Old-growth redwoods and magnificent waterfalls compete for attention with some of the most beautiful coastline in the country. One of the best ways to appreciate such natural beauty is by bike, hike, or horse. 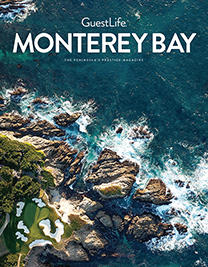 The Monterey region teems with vast, open spaces where outdoor enthusiasts can enjoy playing. 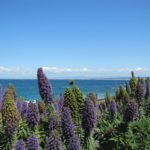 Despite the landscape often taking a back seat to the bountiful blue Monterey Bay and Pacific Ocean, it is serenely spectacular and worth discovering in a deeper way by hiking, biking, or horseback riding. Find the perfect Monterey trail for your favorite pursuit, whether on two wheels or two feet. For road cyclists and mountain bikers, the hundreds of miles of bike trails and plenty of options to link roadways create a wealth of opportunity to tour the Monterey Bay region. The entry point for many bikers is the Monterey Bay Coastal Recreation Trail from Fisherman’s Wharf to Lovers Point, and even if you don’t advance from there, the easy round-trip ride affords beautiful bay views. The 14,000-acre Fort Ord National Monument, a one-time U.S. Army base, has several paved roads that allow riders to seek a more challenging route. Choose to explore on your own, or try the easier 5-mile Parker Flats Loop or 8-mile Parker Ranch Loop, which is packed with thigh-burning climbs and sweeping views of Salinas Valley. And it’s hard to say no to breathtaking Big Sur; expert riders can tackle Highway 1 (both an All-American Road and a State Scenic Highway) and its steep pitches to reap the reward of the stunning, wide-open ocean. Just remember to keep your eyes on the road while you’re pedaling. Soberanes Canyon Trail in Garrapata State Park. Celebrated as Monterey Bay’s “Refuge by the Sea,” Asilomar State Beach in Pacific Grove boasts 107 acres of coastal land among low beach dunes and rocky inlets. Between the conference center, located inland from the coast, and the trail that runs along the shoreline lie 26 acres of restored sand dunes, providing an ecological boundary between shoreline and Monterey pine forest. The mile-long coastal trail in between residential neighborhoods provides easy walking access and features side paths that lead to tide pools. Nature lovers flock to Point Lobos to enjoy its legendary beauty. With rocky shores and crashing waves, the park has long been considered one of the most popular of the state park system. It’s almost impossible to choose a favorite trail among the headlands, coves, and rolling meadows here. Fourteen acres are occupied by the Marina Equestrian Center, where lessons on experienced and gentle school horses are available. Guests learn to handle a horse from the ground, as well as groom, tack up, and ride. Fun fact: The nonprofit Marina Equestrian Association began as a military-family organization that once operated out of Fort Ord Stables. You can also experience a full range of equestrian services at the Monterey Bay Equestrian Center: scenic rides along beaches and through the Monterey dunes, a petting zoo, and a romantic horse-drawn carriage for your big wedding (imagine!). Rides begin at $95. Meanwhile, more than 27 exquisite miles of marked equestrian trails run deep in the beautiful Del Monte Forest surrounding the Pebble Beach Equestrian Center. Originally, this acreage served as a boarding stable to host Olympic Team Trials. Choose between daily tours, a group riding lesson, or a soothing experience with a rescue horse. If you prefer to have the horses come to you, consider Seahorse Equestrian Tours. The company rents horses in Monterey and Santa Cruz County. Their skilled riders can take you anywhere from the beach to the forest to the valley. The 2-mile loop created by these two paths at Andrew Molera State Park in Big Sur allows lucky hikers to catch sight of migrating California gray whales. This 6.7-mile trail at Pinnacles National Park has plenty of steep stairs cut into boulder faces and allows views of some of the park’s most iconic rock formations. Get spectacular views and an eyeful of the Santa Lucia Mountains while making this trek in Carmel Valley’s Garland Ranch Regional Park. Relish the waterfall and natural splendor along this 5.4-mile, lightly trafficked loop trail at Garrapata State Park in Carmel. The Skyline Self-Guided Nature Trail in Monterey traverses the summit and features fossils from the Miocene epoch. Bird-watchers can catch glimpses of Townsend’s and hermit warblers, brown creepers, golden-crowned kinglets, red-breasted sapsuckers, and more. Limekiln State Park is located in the steepest coastal canyon in the continental United States right on the Big Sur coast and is home to abandoned limekilns that date back to the 1880s. Follow the year-round creek on the Falls Trail to see a beautiful 100-foot waterfall. 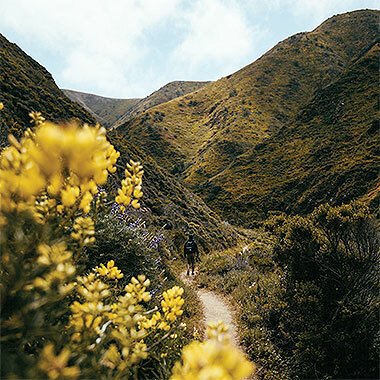 One of the most popular trails in Big Sur, with modest to intense routes and stunning scenery every step of the way. Don’t miss the 80-foot-tall fresh-water waterfall. This 1.4-mile path at Point Lobos State Natural Reserve may be short, but it provides great views of the Carmel coastline and marine mammals. Mountain bikers love this trail at Toro Park near downtown Salinas, where they can climb all the way to Ollason Peak (at elevation of 1,800 feet) on semi-hardpacked dirt roads. The Salinas River runs through this park with adjacent walking trails that overlook the majesty of the Santa Lucia Mountains. Picnic areas and playgrounds are available.